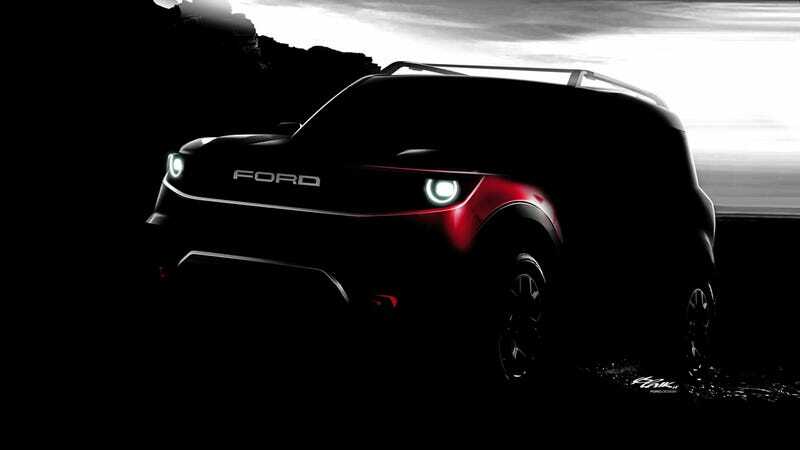 In a presentation for JP Morgan, Ford VP of Product Development Hau Thai-Tang said Ford’s next generation architectures were flexible and shared information on a new utility that sounds a lot like, and probably is, the mini-Bronco they talked about in March. Modular platforms are nothing new, but now we know a bit more on how Ford plans to display the one it is doing. Thai-Tang also states that it is going to allow them to “command really high pricing premiums,” all of which leads me to believe that the mini-Bronco will be a beefier but more expensive version of the Escape. The relationship from the Escape to the Mini-Bronco sounds like it will be very similar to that of the Jeep Compass to the Jeep Renegade, where the latter has a $6,000 difference. He closes out that portion of the presentation by stating that they will be able to share many components across that C2 architecture which will allow Ford to share things like suspensions and the cross car beam across many vehicles in the lineup. We are likely to see a softer variant of this new suspension on the Lincoln Corsair which is the rumored Lincoln MKC replacement that will be built on the same platform. While explaining these modules, Ford gave us the best look yet of what appears to be the interior and powertrain of the upcoming Ford Explorer. The illustration in the presentation shows an SUV with brake caliper arrangement that matches the Explorer mules that we’ve seen in recent spy shots. We can see that it has three rows of seating and is set up for AWD in the illustrated image. It also appears to be powered by the 2.3-liter EcoBoost engine as the configuration of the oil cooler and filter matches the configuration that was previewed for that motor in the upcoming Ranger. This was not the only future product news that was reveled in the presentation. On the very next slide, we see an interior showing a very large screen and an LCD instrument cluster, reminiscent of the Tesla Model S. Thai-Tang states that this is an example of an infotainment system developed by the “Team Menlo” group that will be modular and used across architectures. This center display was mentioned by Thai-Tang as something Ford recently changed for its upcoming battery-electric crossover dubbed “Mach 1.” According to a source familiar with the project, this crossover will be on the CX727 platform and the interior will likely be very similar to what is shown in that presentation. Rumor is that the “Mach 1" name is slowly starting to fade away inside of Ford due to the poor reception. The CX727 name pops in LinkedIn profiles for assembly line project managers in Mexico, which would match up with the report from last year stating that this long-range electric crossover would be built in Cuautitlán. The presentation also shows a preview of Ford’s future lineup. There’s no specific timeline mentioned but we see some vehicles that have not been revealed yet. The Mustang is front and center but in the lower right corner we can see some kind of SUV, possibly the Bronco, and based on the image it appears that there will be a three-door and a five-door version. The usual suspects—Ranger, F-150, and Super Duty—are sprinkled in the image but there also appears to be a much smaller truck hiding towards the back which might be the small unibody truck that we heard rumors about recently. Draped models are hard to tell apart but we can at least get a sense of basic features. It also appears that there is some sort of autonomous vehicle in the far right corner as first noticed by reporter David Undercoffer. Noticeably absent from the lineup is the Ford GT but it might just be outside of the window for this whole lineup as it was only intended to be built for a few years. There might be a few others that we missed, but maybe someone with a keen eye can point out the rest in the comments. Ford’s all-new yet-to-be-named rugged small utility will be a no-compromise 4x4 for thrill seekers who value off-road functionality. We’ll have more details to share later.